Exhaustively tested by leading competent authorities, the Sundek Glass Back Wall for Squsah Court meets all recommended safety standards and building codes. The design, manufacture and installation of all components are rigorously controlled and guarantees that repeated high energy impacts can be withstood without breakage whilst still providing an ideal court wall. The unique door hinge completely eliminates the risk of finger being trapped in the door. The Glass Back Wall for Squsah Court give spectators a clear unimpeded view of the action happening on the court which also helps in coaching and provides a good view for the referee. The material used is wholly compatible with 12 mm toughened glass and able to cope with the constant stresses applied. 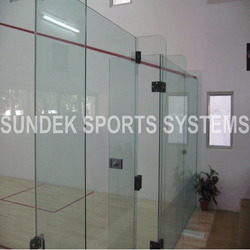 We supply and install Sundek “Clear Tough” free standing and maintenance free glass back wall system confirming the WSF (WORLD Squash Federation) requirement made of 12 mm micron clear toughened glass with 4 panels 1 door, 4 fins, fixtures & fittings and all other materials for erecting the glass wall system. The height of the glass wall is 2130 mm above the finish floor level. We will require 6400 mm clear opening between two sidewalls for installation of the glass back wall. We will also require a niche in each sidewall and a concrete sub floor outside of the court area. Details of these will be furnished on receipt of the order. Our skilled team trained under the official installers of international squash tournament will erect the glass wall completely with panels, fins, door lock etc and finished with suitable sealant.